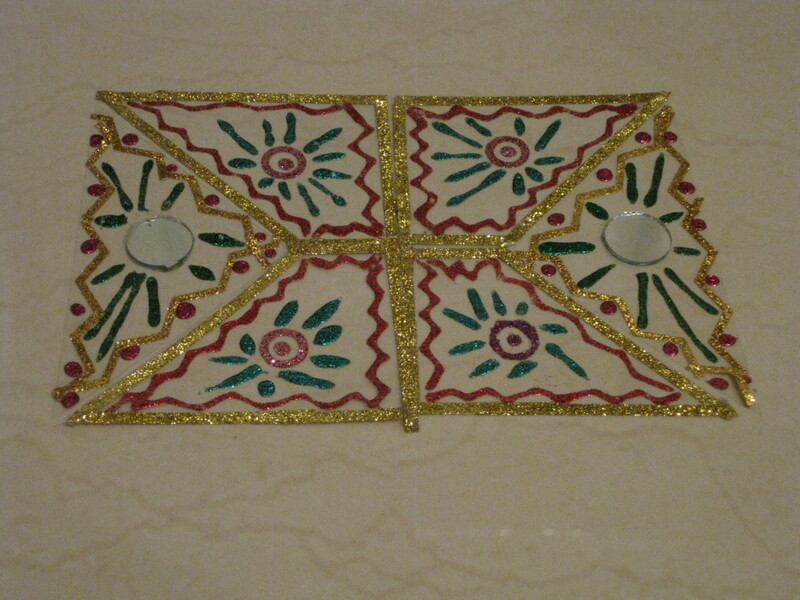 On festive days, almost each and every home in India is conspicuous by the presence of elaborate floor decorations. Intricate floor patterns adorn the floors of prayer rooms to honor the Hindu deities. Colorful floor patterns also decorate door-steps, stairs, home-entrances and garden-patios to mark the sign of festive celebrations. 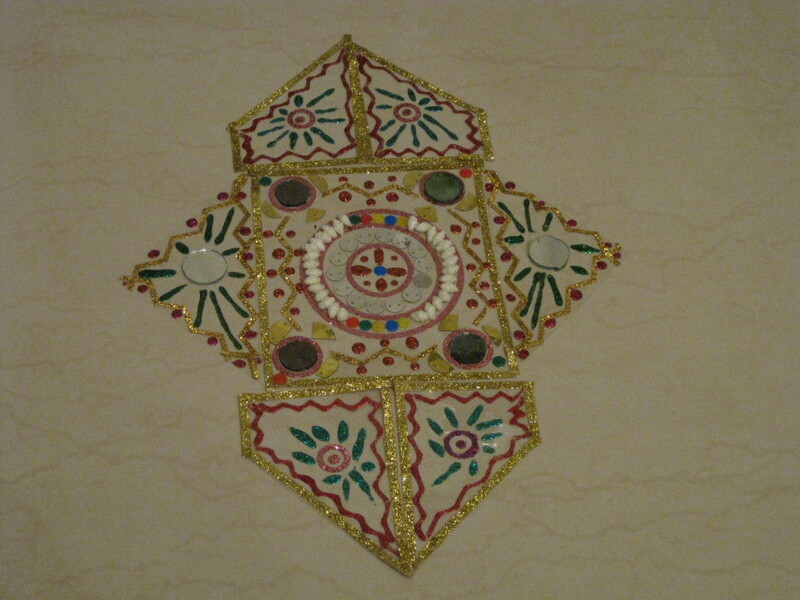 Wedding-halls adopt this special tradition as an auspicious symbol. Five-star hotels and resorts display pretty floor patterns to overwhelm the guests with a grand welcome. This Indian tradition has been in practice for many centuries. Talent-competitions have been conducted in schools, colleges and venues in order to preserve this key tradition. Now it is considered as one of the hallmarks of Indian arts and cultural heritage. Indian floor patterns are called by distinct names in each state of India. 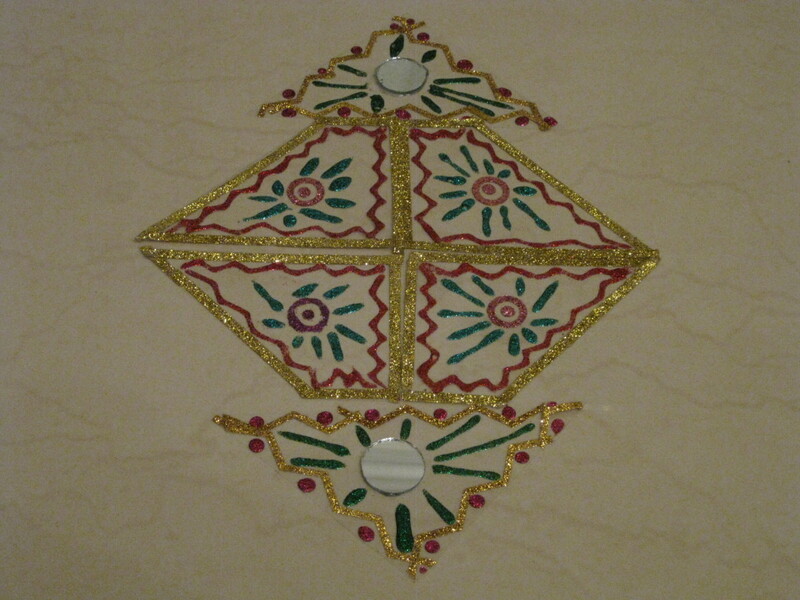 It is commonly known as rangoli in North India and kolam in South India. With each state, they differ on the basis of design, the use of materials and the way of creating them. 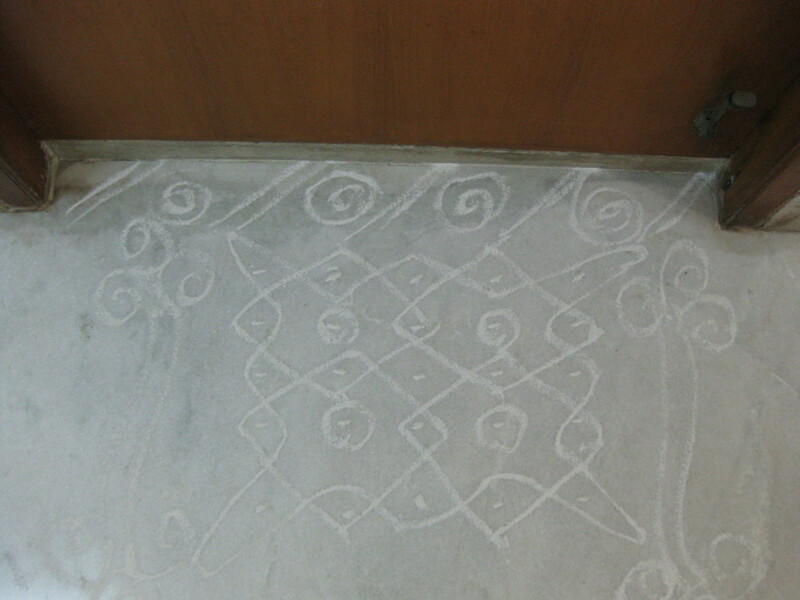 These patterns are traditionally drawn in front of the entrance of the house. 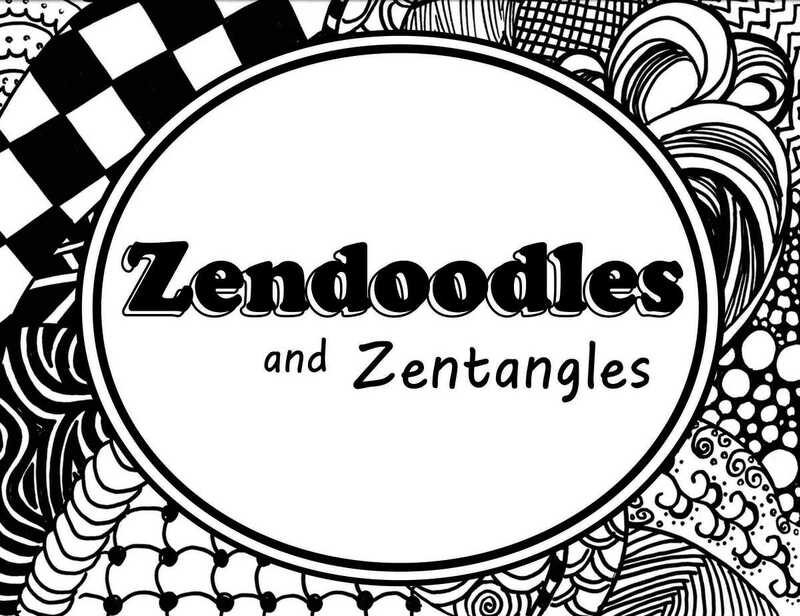 They are created by joining the dots through lines to form cubic and fractal patterns, using white rock powder or white rice powder. 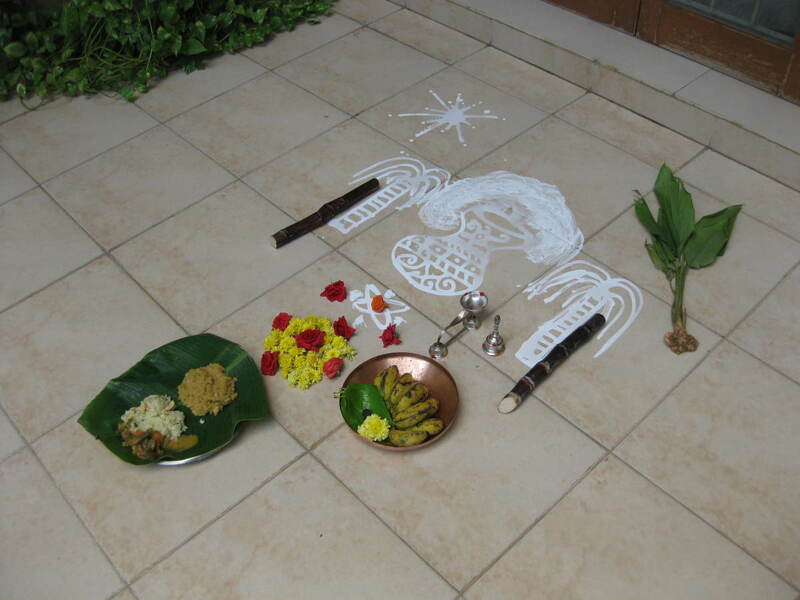 On the day of Pongal, an important harvest festival of a South Indian state, Tamil Nadu, the floor decorations are created using liquid rice-flour. The key designs comprise of sugarcane trees, pot with overflowing rice and sun. 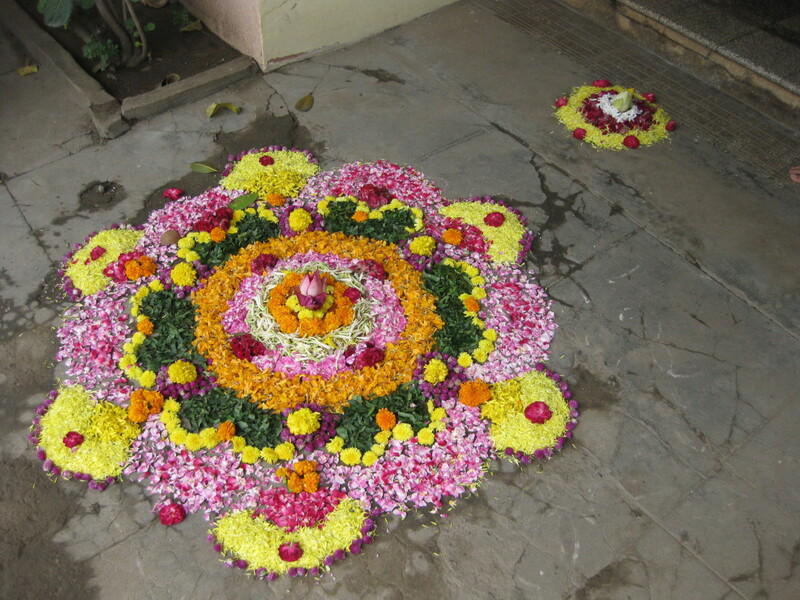 Onam, the famous festival of another South Indian state, Kerala, is characterized by stunning presentations of floor decorations using fresh flowers. These vibrant floor patterns are created in floral designs, using colored powder and decorated with oil-lamps or candles. 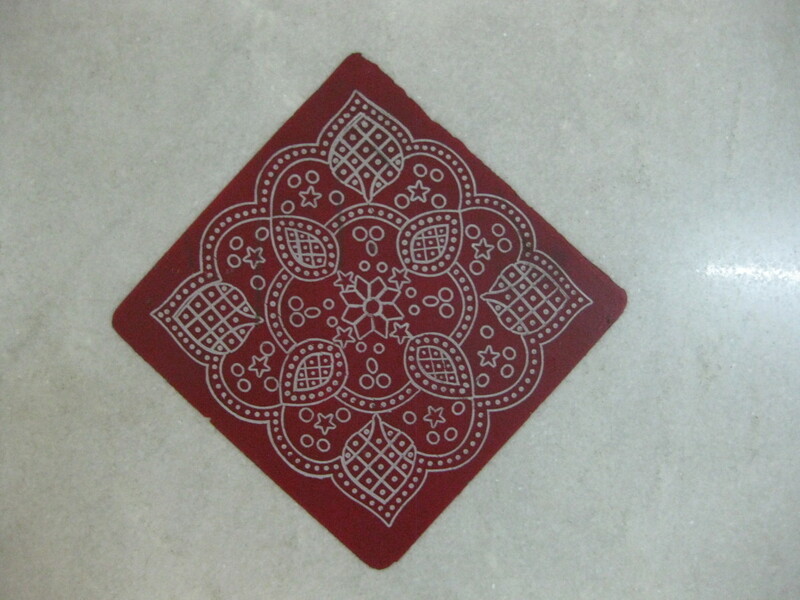 Recently, people paste sticker floor decorations on floors as they are easy to use and maintain. 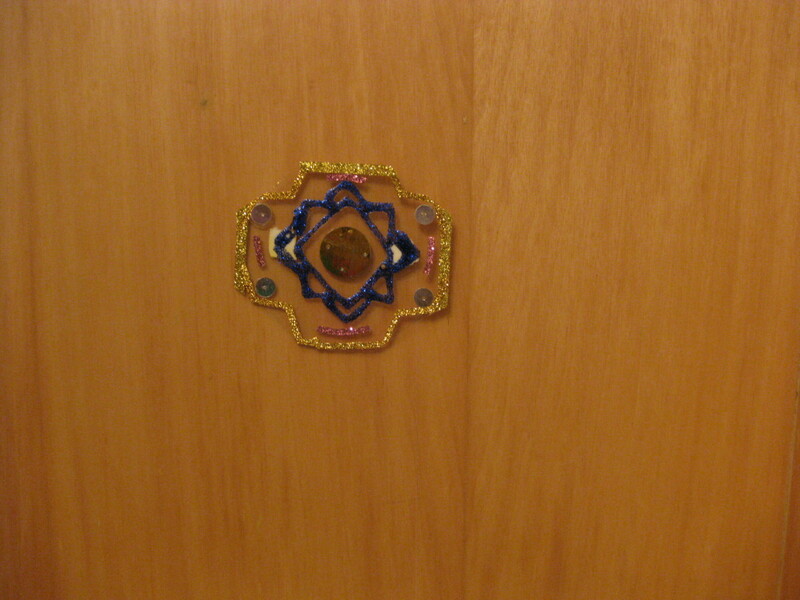 In some houses, walls are also adorned with these sticker decorations. 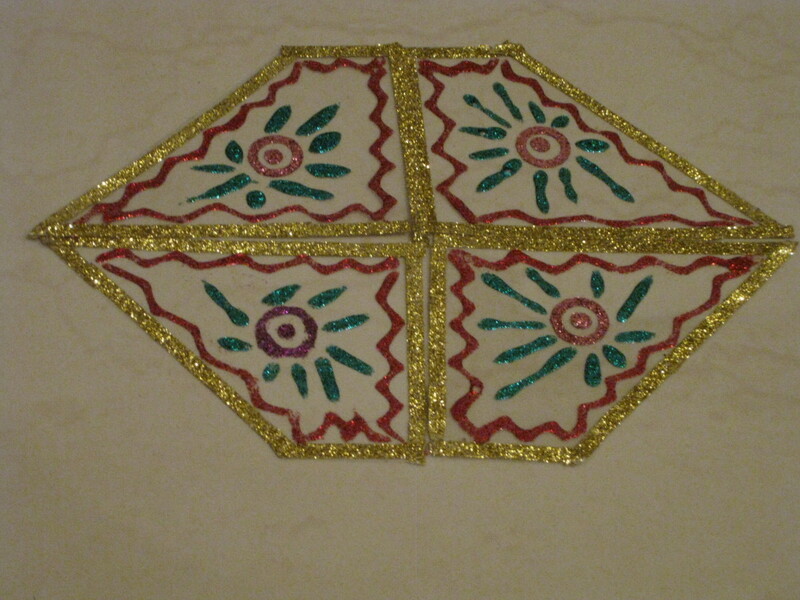 These fashionable floor decorations are called folding rangoli. 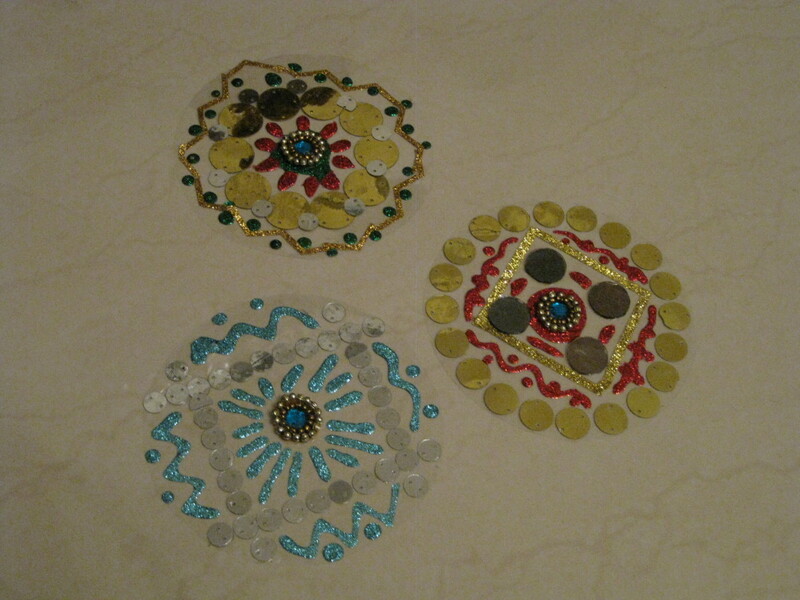 They are embellished plates made of thin plastic sheets studded with imitation rhinestones and pearls. They appear in a variety of shapes, sizes and colors. They are a huge hit with Indian people. A few months ago, I and my parents visited one crowded shop for festive shopping and there, a vast array of pretty floor decorations attracted us. We decided to purchase one floor decoration, even though it was quite costly. My mother became fascinated by them and wished to buy more irrespective of its prices. 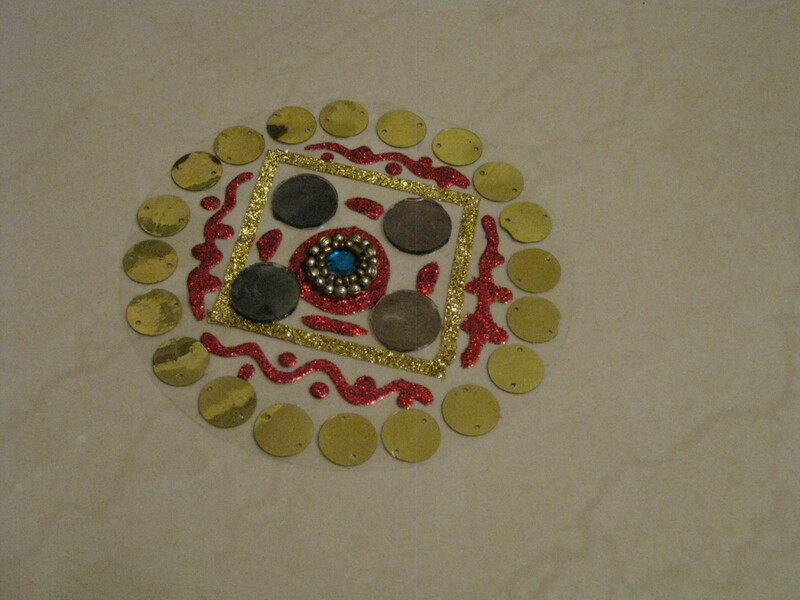 Suddenly, an idea hit me and I assured my mother that I will create similar floor decorations myself. My mother, having faith in my creative abilities, told me to go ahead. 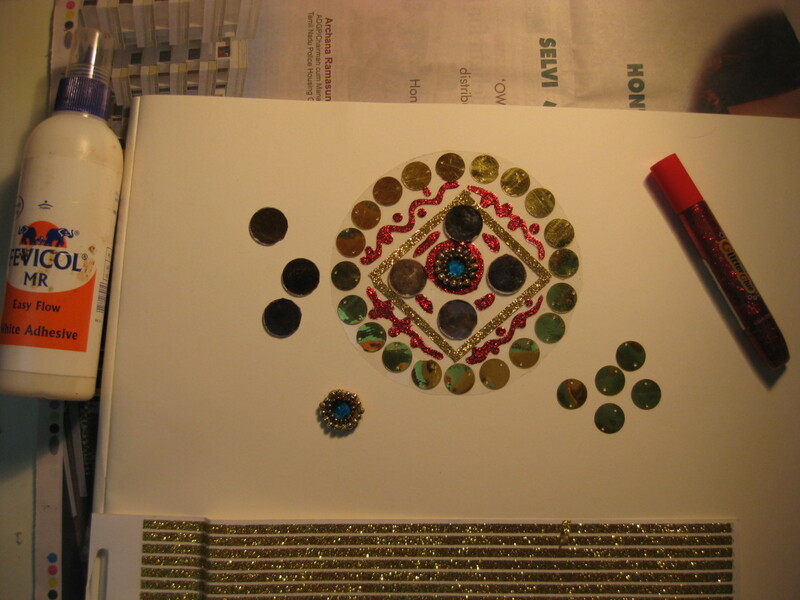 This is one holiday project that is not only creatively stimulating but also is gratifying. If you find anything made of plastic paper such as boxes, folder and wrappers that are crystal clear and sturdy, use them for creative activities. Pretty embellishments on invitation cards, small stones on old gift boxes and anything that caught your eye would be useful for your craft projects. Highlight your floor decorations with small rhinestones, pearls, mirror-pieces, seashells and other stone-studded embellishments. 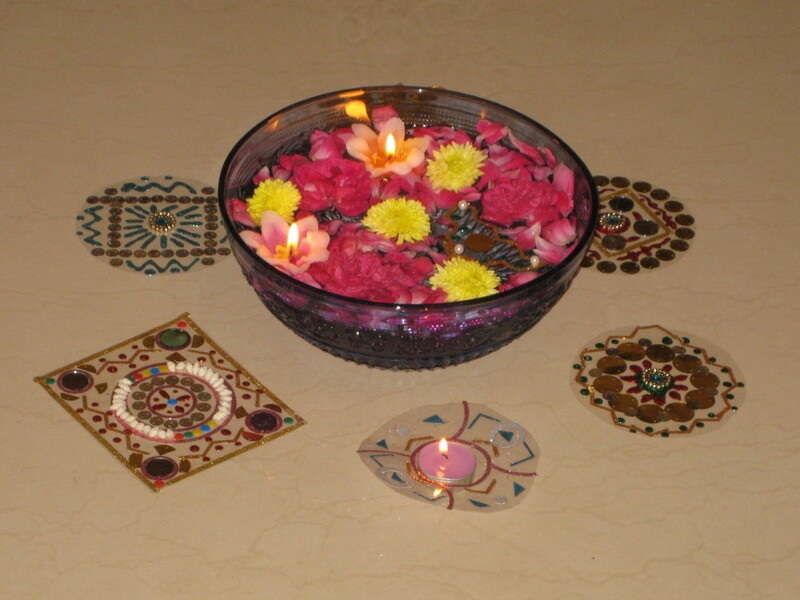 Beautify your floor decorations with candles and flowers. 1. 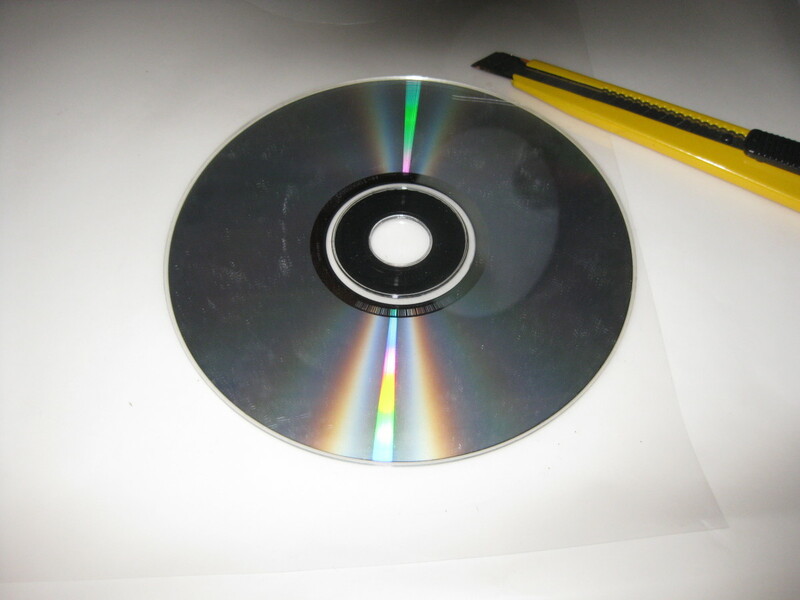 Use DVD as a template and place it on the plastic paper sheet. Draw a circle around its edges, using a sheet-cutter. 2. 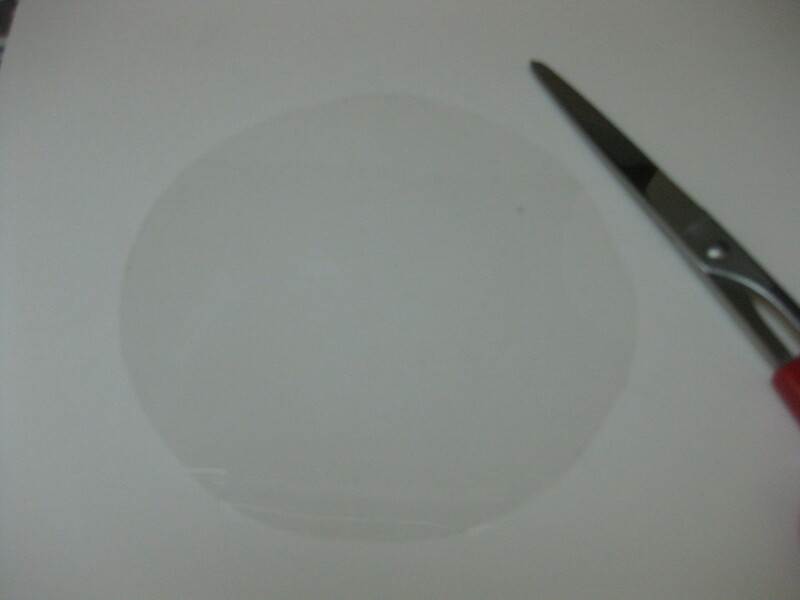 Cut it carefully to get a circular-shaped plate. 3. Decorate the plate with embellishments, glitter-stickers and glitter-glue. Then leave it to dry under the fan for a few hours. 4. 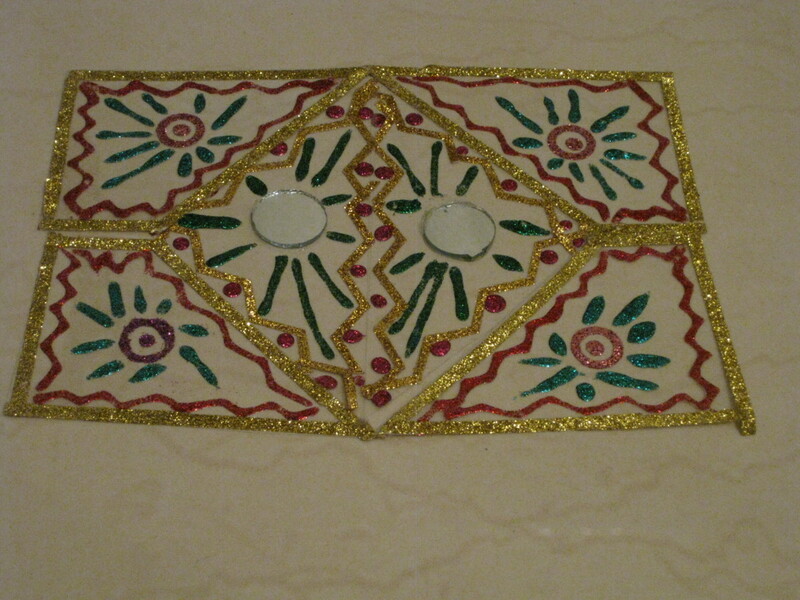 Your decoration is ready to adorn your floor, door-step, stair-case, patio and any place of your choice. You can create many floor decorations of different shapes, sizes, designs and colors, using your vivid imagination. Note: Wear gloves to keep your hands from getting messy. 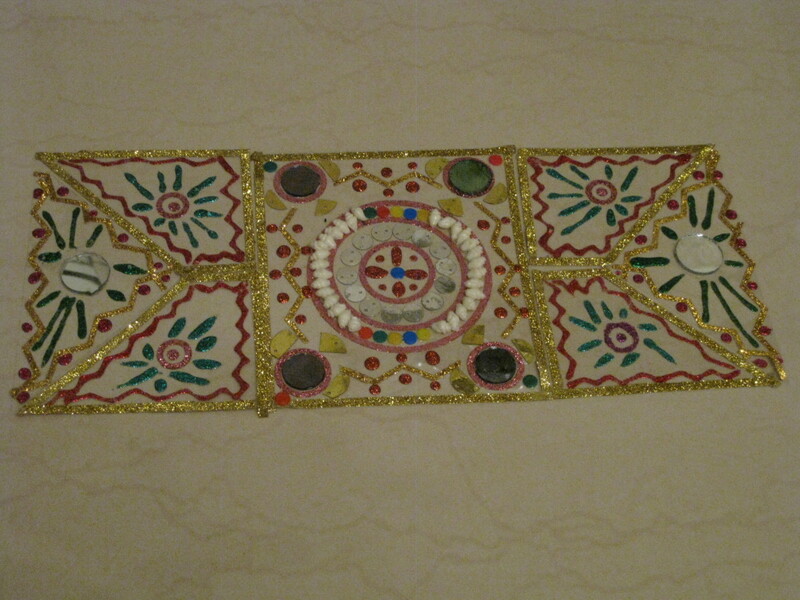 These decorations are not only for adorning the floors but also make attractive home décor accessories. 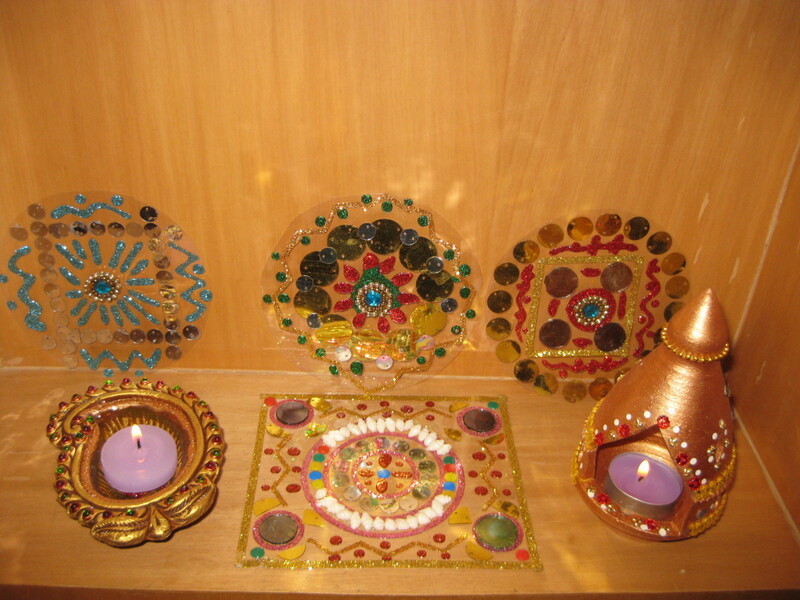 They would be ideal decorations for Diwali festival and add plenty of color and shine to your rooms. You can make a mini wall-hanging. 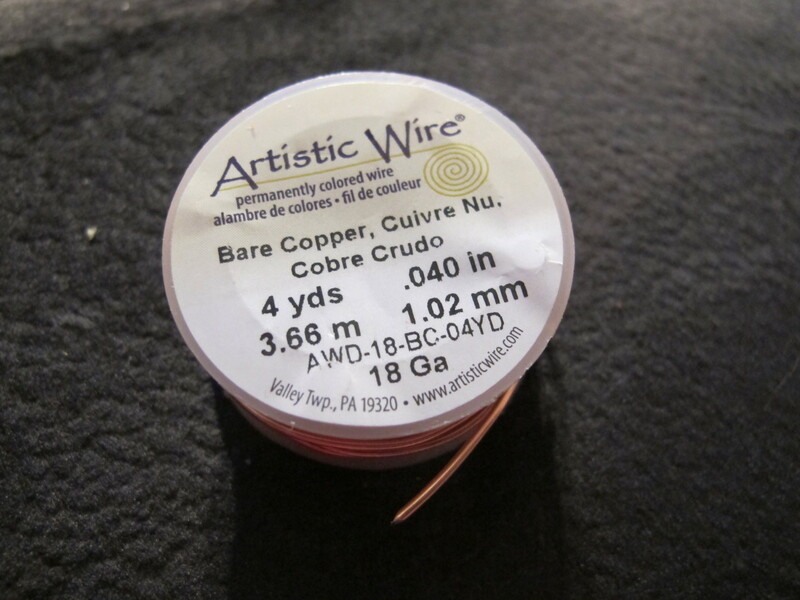 Make a hole on top of the plate using a perforator and make a loop, using a thick thread or fabric-string. You can add trinkets, using a sturdy plier to open its loop and insert it through the hole. Then close the loop with the plier. These decorations would make bright magnets. You can buy magnetic buttons online or from local thrift stores and paste them on the back of these decorations. Place them on the refrigerator or wooden pillar or any place of your choice. You can use them as floating decorations for your bowl-vase. Add fresh flowers and floating candles to the bowl-vase and let your decoration mingle with them. Ensure that this decoration is floating evenly and lightly. 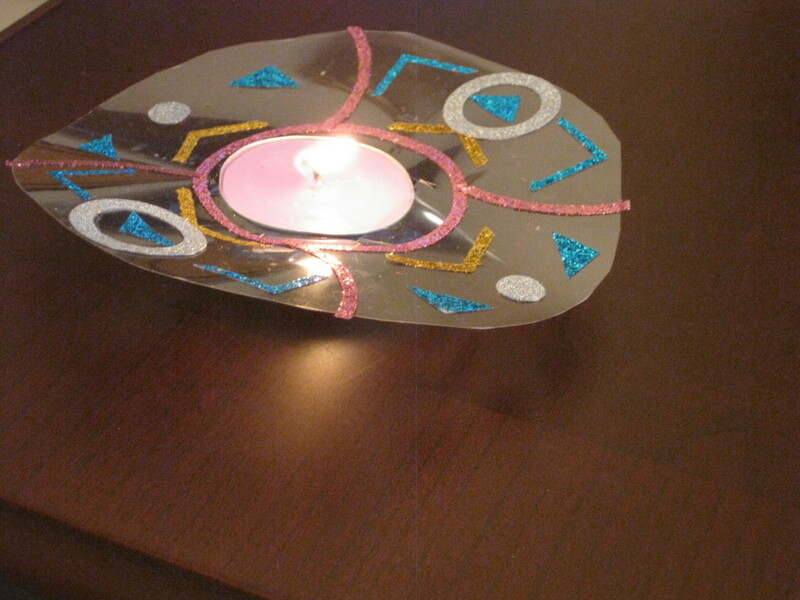 You can create candle-holders by making a hole (depending on the size of candles) in the middle of the plate or many holes near the edges of the plate, using the sheet-cutter, scissors or perforator. Then place the candles in these holes. These decorations can end up being striking sun-catchers. Tie them with a brightly colored fabric-string and hang them in your terrace or in other open place of your home. These decorations would be eye-catching centerpieces for your tables and mantelpieces. You can decorate your living room table or dining table with these decorations as well as candles and flowers for a festive look. You can create coasters with a very big hole in the middle for the glasses so as to avoid damaging the embellishments. 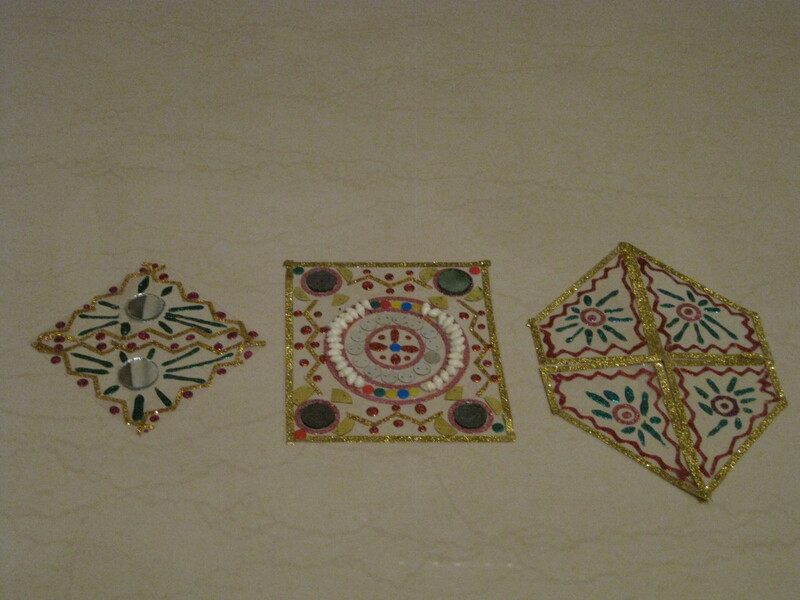 Apart from typical Indian designs, you can incorporate your own designs and themes such as artsy, mosaic and vintage. They would make vibrant decorations for Christmas and other important celebrations. You can customize your decorations according to the celebration and season. For example, for Christmas, you can use red and green colors and for the winter season, you can use white and silver colors. You can string these decorations and use them for birthday parties and other special occasions. 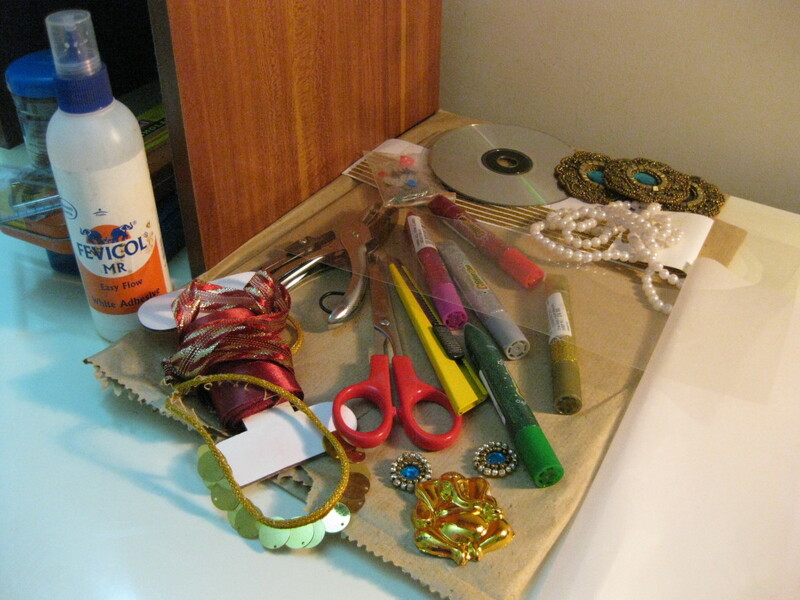 Other than plastic paper, you can use any type of paper and other base materials. The list of creative suggestions is limitless. It is up to you to conjure up your own creative ideas. 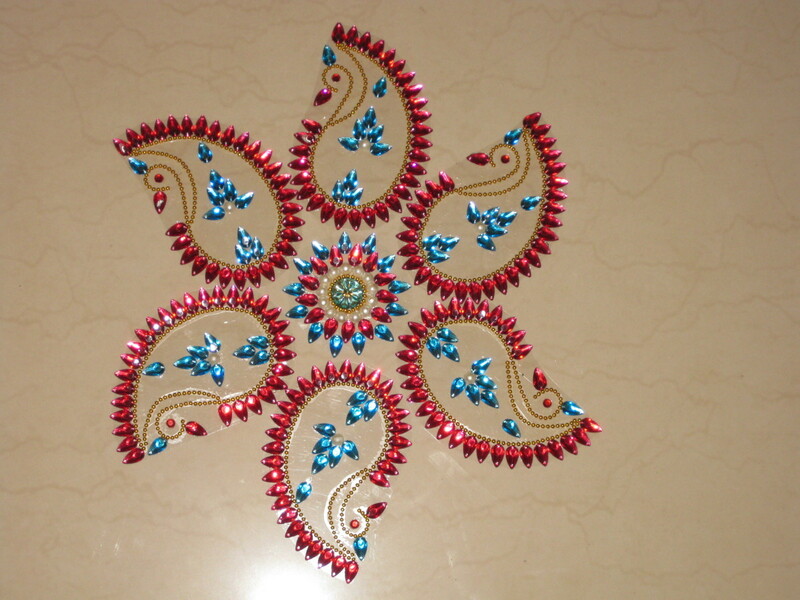 Would you like to try this Diwali craft project? Unlike Christmas, Halloween and other celebrations, the date of Diwali varies from year to year according to the lunar cycle. Every year, we look forward to Diwali which is the festival of fireworks, oil-lamps, sweets, prayers and family get-together. I and my family love decorating our home with many oil-lamps, candles and flowers. 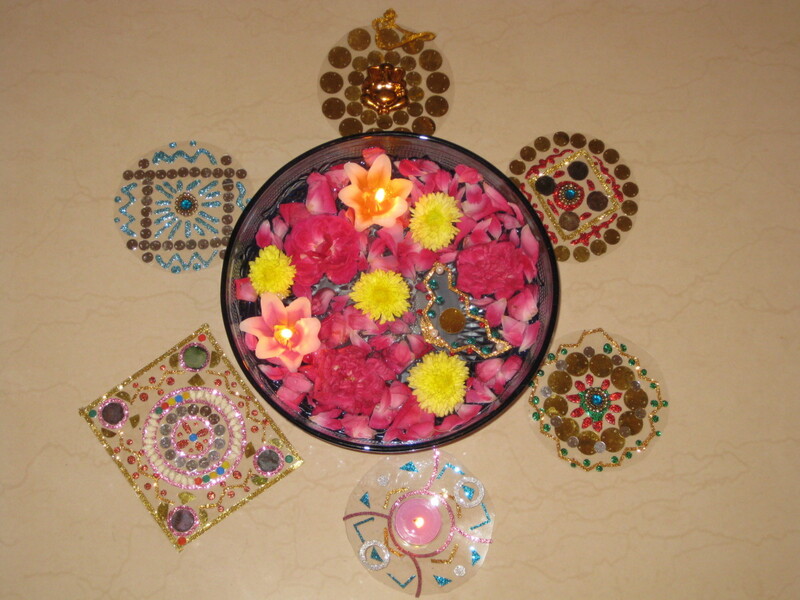 Now these handmade decorations joined the medley of Diwali decorations. As for me, it was overwhelming to see my mother's face lit up with happiness at her acquisition of floor decorations that she deeply desired. I found this holiday project so delightful that I decided to create some more for my relatives. This is a simple and fun holiday project for kids and adults alike. Small kids can undertake this holiday project, provided they do only harmless decorative work and the rest will be done with the complete help of grown-ups. Not only these decorations enhance your home but also would make wonderful gifts for your friends and loved ones. Note: Remember not to keep candles or oil-lamps too close to the decorations. Now put on your creative cap and enjoy! It looks as if Diwali has come around again. I am sure you are busy with your decorations for this year. You have certainly provided us with a look into an age old custom in India and one way that your family has adapted to make the decorations for it. Your pictures are beautiful and your subsequent creations are lovely. Your mother was right to let your creativity reign. This is such an instructive article for anyone who decides to make floor decorations in time for Diwali this year. Voted up and useful. These are so beautiful especially your great pictures. I had never heard of these before. I love making things with shells. So now have something new to try. I love crafting! This is a beautiful idea. Congrats on this winning HOTD. I have painted floors before; now I want to try your method. 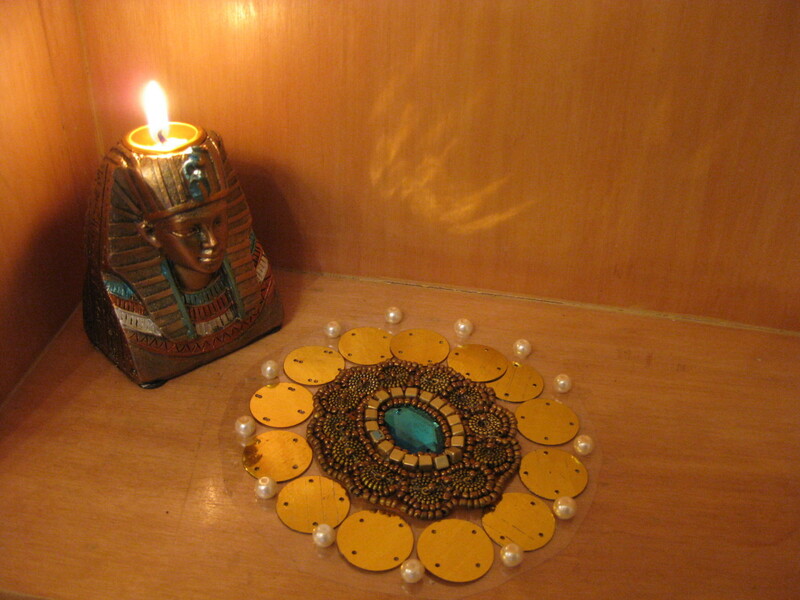 I came by to take another peek at this beautiful Hub about handmade floor decorations. Our new apartment has tile floors, so this would be a practical way to dress things up. I'll have to start looking for materials so I can make a really pretty one. Thank you for all your instructions! 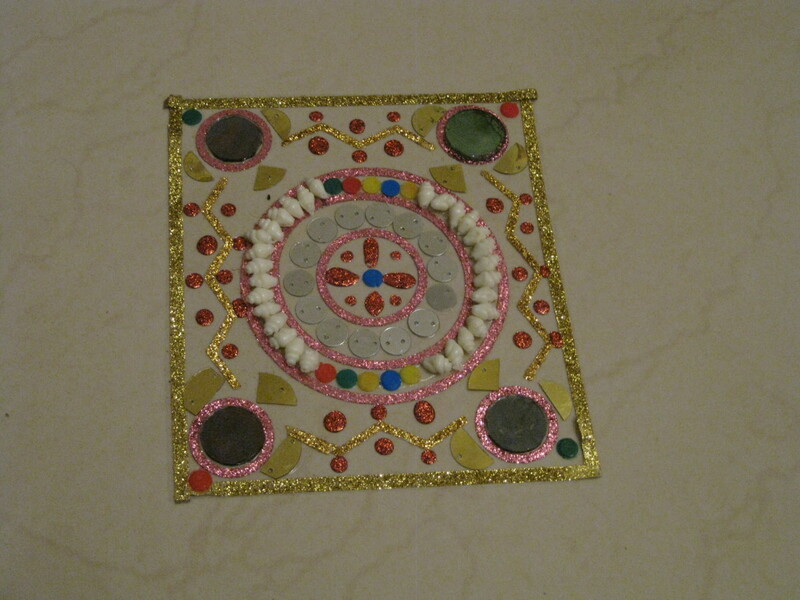 @ Indian Chef: Thank you for the read & sharing your enthusiasm to try this fun craft. Please let me know after you created them. Happy Hubbing! 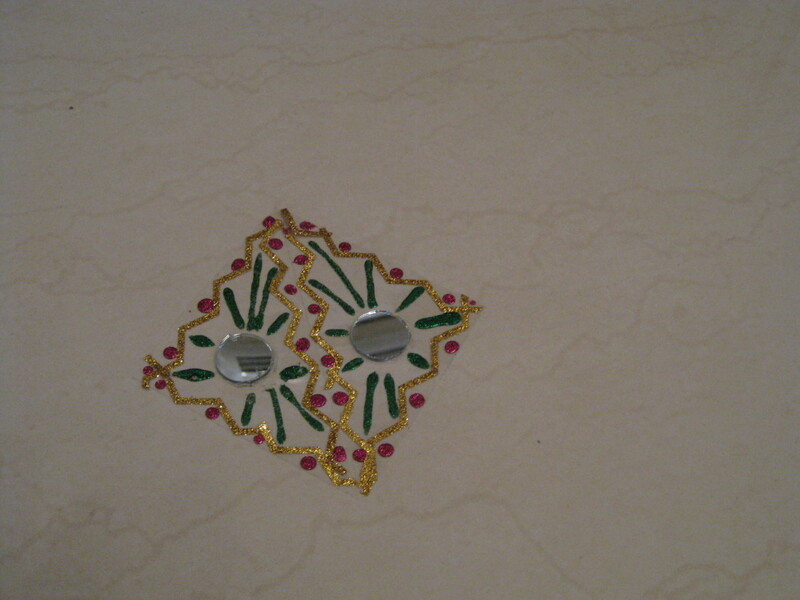 Hi ishwaryaa, it was very nice rangoli pics that you have posted here. 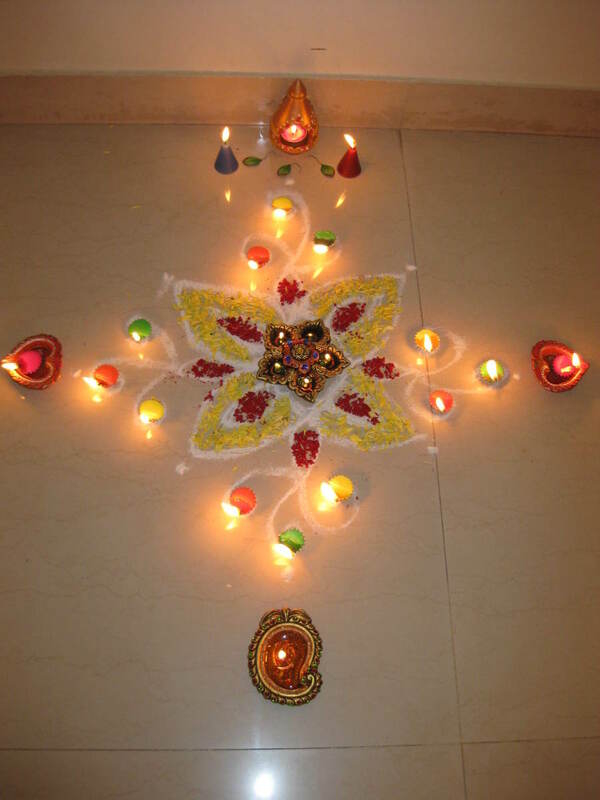 They are very beautiful and though we do not make any Rangoli during Diwali but this year I would like to have one in my house. Voting up and sharing on twitter. How did i miss this!! WOW, stunning absolutely gorgeous. I loved all the designs you showed here and learning about this age old tradition. I agree with Sharkye they are too nice to keep for special occasions. so many wonderful ideas here and loved all your info and pictures, well deserved HOTD. Congrats again a superb in depth article bringing your great culture to the forefront! Vote up, interesting, useful, awesome, shared and pinned! 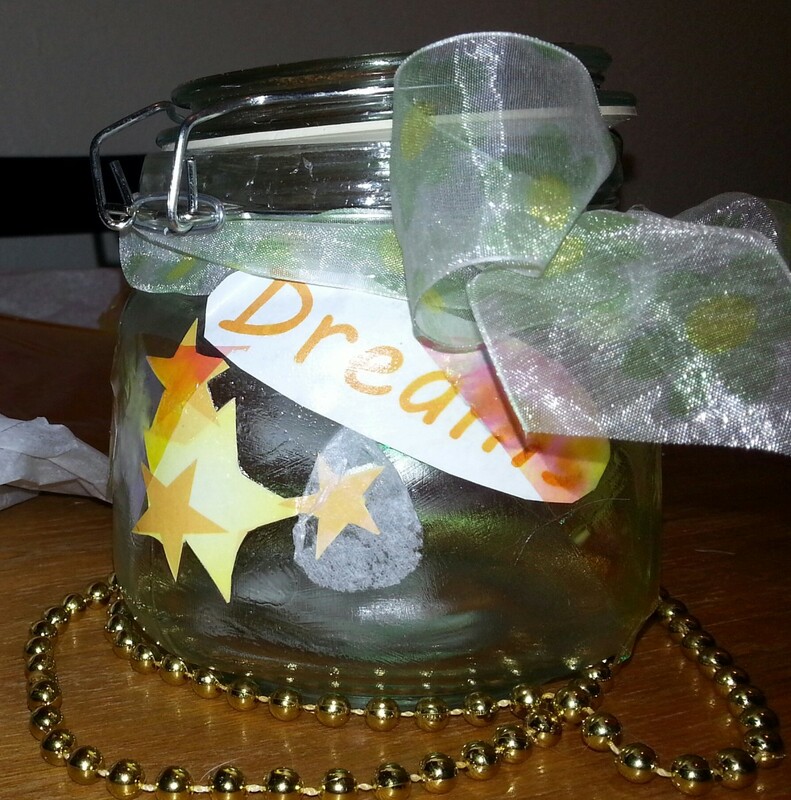 @ Sharkye11: Thank you for the read & sharing your enthusiasm to try this fun craft. Hope you enjoy this as much as I did! Happy hubbing! Beautiful hub! Those are too gorgeous to be only used for a holiday...I am looking forward to trying some for permanent decorations. Thanks for all the inspirational photos and the wonderful knowledge about these customs. Voting and sharing! @ Mama Kim 8: Hi, thank you a lot for telling me that you adopted this craft for Christmas. I am very sure that you created beautiful decorations. I would like to see your creations. Happy Hubbing! I used your idea and made these!! Only I made them hangable as christmas tree decorations ^_^ Thank you so much for the fantastic craft idea!! A very unique idea!! I think that these would get a lot of attention at parties. Shared, up, useful, awesome, pinned, tweeted. I enjoyed this look into the customs of another culture. The floor decorations you created are beautiful! @ lifetips123: Welcome to HubPages! Thank you for the read and yes, I remember your list of foods that begin with the letter D in the questions and answers section. Take care! Very inspiring hub and you are creative person. I know about Diwali celebration. Thanks for share beautiful idea about handmade creation. Voted up! Today only I came back from my native place and seeing that this hub had been one of the hub of the days, I was too happy. Once again, your creativity and imagination glitters gloriously and these Diwali decorations are very useful and economic. Belated Diwali wishes and belated congratulations for "Hub of the day!" Up and useful, awesome and beautiful. Thanks for sharing!! It is a very interesting hub, ishwaryaa. I like the white designs on floors or on cemented surfaces from rock or rice powder. 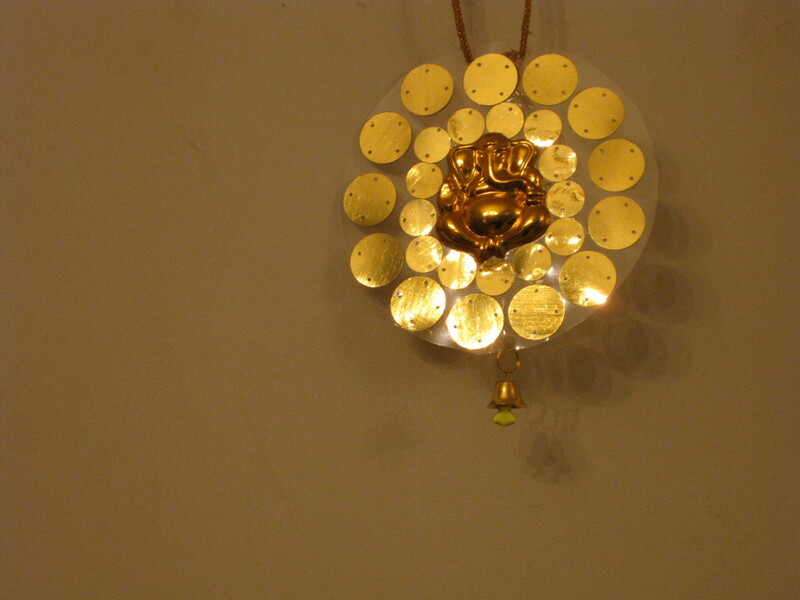 You also have beautiful, interesting, intricate shiny designing there that adds glow to a home. 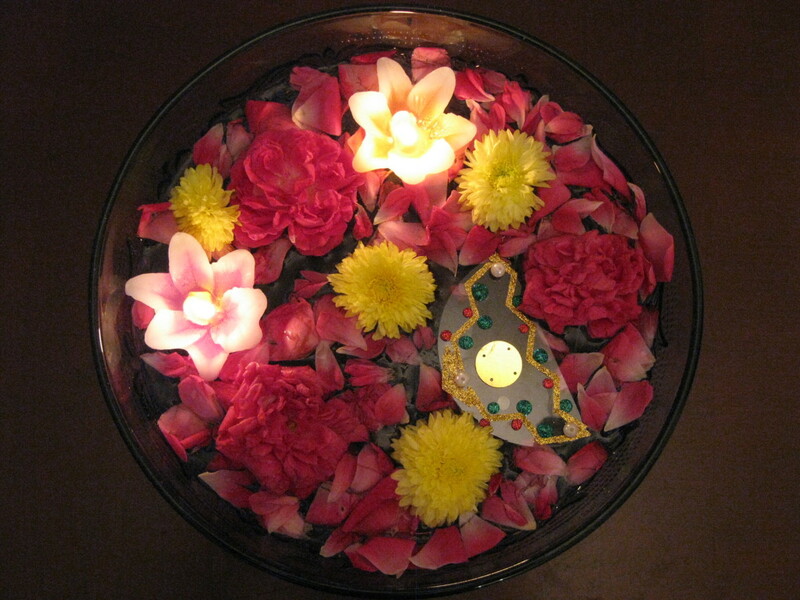 The floral and candle floats in a bowl are very pretty! @ anuramkumar: Thank you for reading and commenting. Also thank you for the suggestion about posting videos and I decided to post videos in my future hubs. Take care. Well job done, very innovative indeed. keep it coming .....Congratulations as well on the hub of the day. @ FolliediVetro: Welcome to HubPages! Thank you for the read and for your encouraging comments. 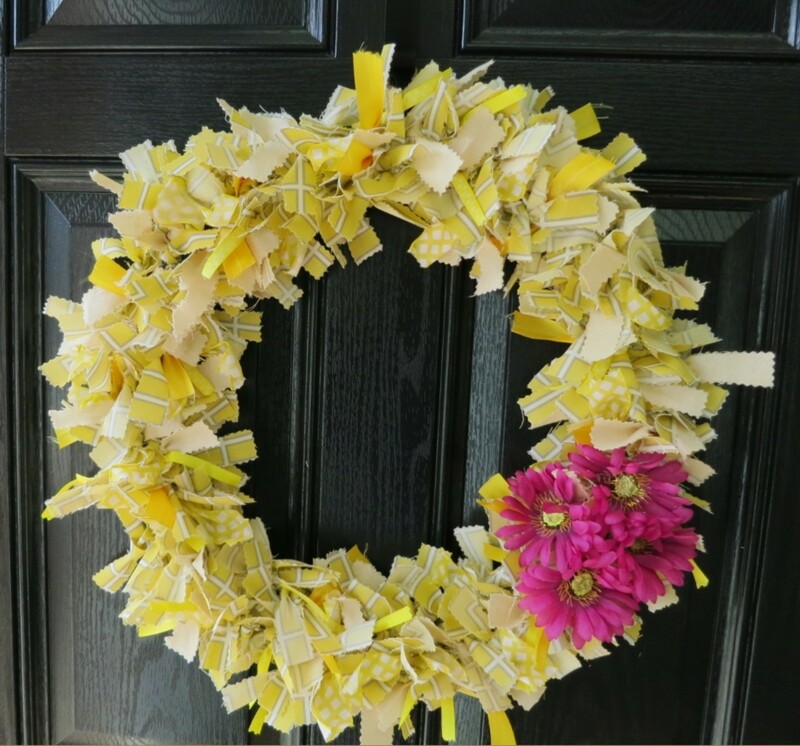 Hope you get to try this craft project. Happy hubbing! These are beautiful and I can't wait to make them! This hub was so well-written and colorful. I couldn't stop looking at the designs. I too bought one such decoration this time for navarathri golu. Your instructions are clear, but it would have been very helpful if you can post a video of it. Will you be able to do that? Good hub & great suggestions. I love the designs. I just wanted to come back to say Congrats on this HOTD. When I first read this Hub, I thought to myself: this would be a wonderful HOTD. Glad HP thought the same way. Congratulations on your beautiful HOTD!! You are very deserving. Great job. Congratulations on HOTD! I loved this hub the first time I read it! Oh, wow! These adornments look so intricate, but your instructions make tnem look quite easy to make. You are so talented. Thank you for sharing this lovely idea with us. This looks like great fun to do, and your decorations are so beautiful. Congratulations on your Hub of the Day! Beautiful hub! I love the ideas you shared here! Congrats in the HOTD!!! I never heard of This before. How beautiful , I love this tradition. Thanks for sharing and teaching me something new. Hi Ishwaryaa22, and what an exceptional hub this one is. I clicked 'facebook like' a few days ago and, I also voted up, but I guess I didn't comment. Well, I'm commenting today to congratulate for winning HOTD and for an excellently written article! Beautiful! I have not heard of floor decorations like this. You´re very creative. I like this awesome design. It´s good to know other countries customs and tradition. Voted up and more. Thanks for sharing. BTW, Congrats on the HOTD. What a colorful and honorable craft! Truly a joy to look at the creations. 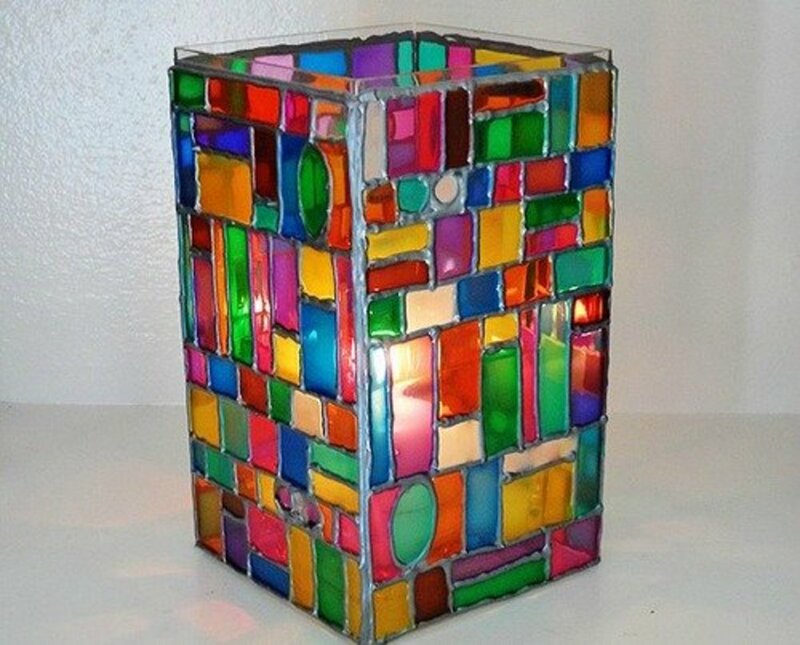 Thank you for sharing such a cool DIY project. Congratulations on HOTD. Well deserved! Very useful! Thank you so much for all that. That's so creative! Congratulations on your Hub Of The Day - very well deserved. Fascinating and interesting. Great hub Ish. 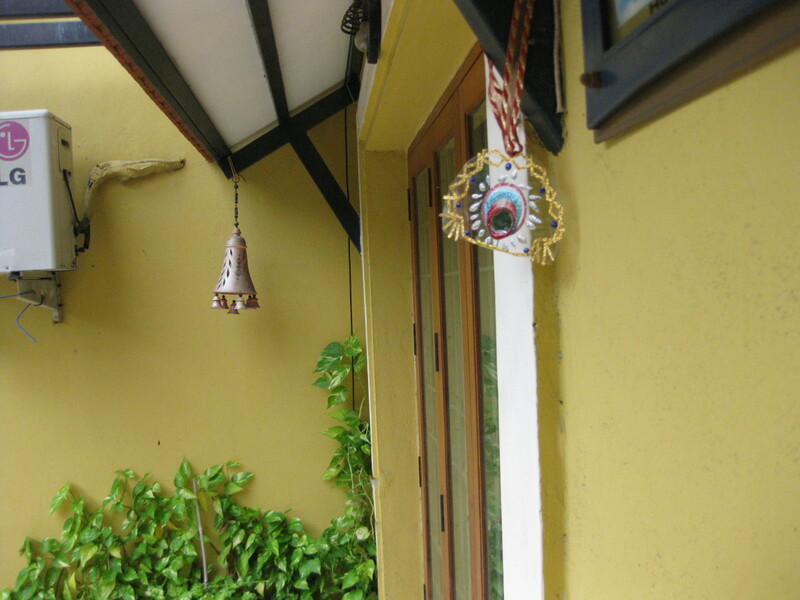 Beautiful decorations showing your creative talent. Enjoyed reading it and all the awesome pictures here. Cheers, Rema. Happy Deepavali to you dear. May god bless and light your life with happiness and joy. This Hub is very fascinating,I like the use of colors you do and the informations about traditions and design.This is a great Hub for me. @ Dolores Monet: Thank you for the visit, read, votes and comments! Voted up and aewesome1 I particularly loved your friend's floral design. She is so talented and creative. I can't imagine the patience it takes to create one of these intricate designs. Just beautiful! Wow this is so creative and interesting . I especially loved your wonderful ideas of making sun catchers , centerpieces for tables as well as the coasters. You have put great effort in assembling this Hub and that made the whole article a very nice read with amazing photos. My vote up, interesting and awesome. You are so creative and I just love your arts and crafts hubs ^_^ These are beautiful and I will just have to make them sometime... I bet they would make great christmas tree decorations. Voting a bunch and sharing! Loved your article. It is actually very useful for everyone who prefer to decorate their floors. I would like to share a piece of information regarding the floor decoration. 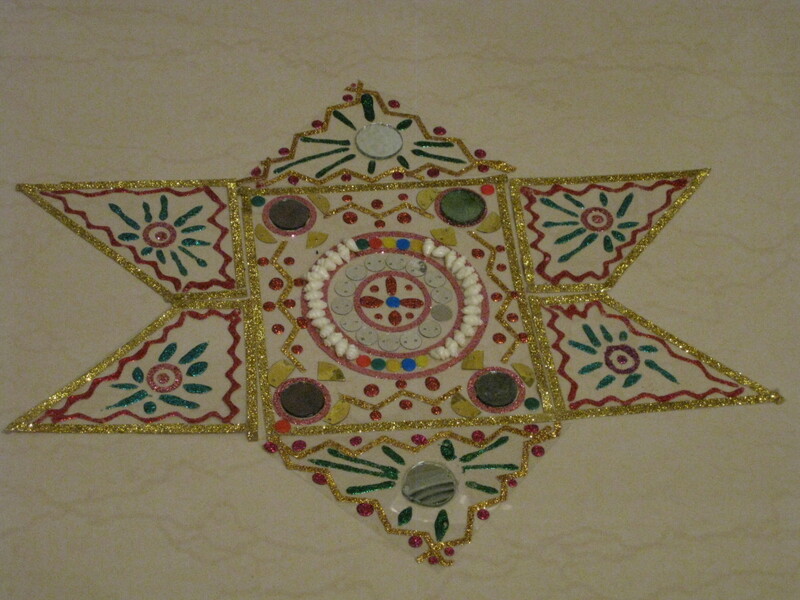 In Bengali the floor decoration which is made of rice paste with the help of a small piece of cloth or cotton is called 'aalpana' Now a days people sometimes use zinc oxide and brush. Usually it is milky white but sometimes artists add a little bit of color especially red and yellow here and there but dominantly it's white. 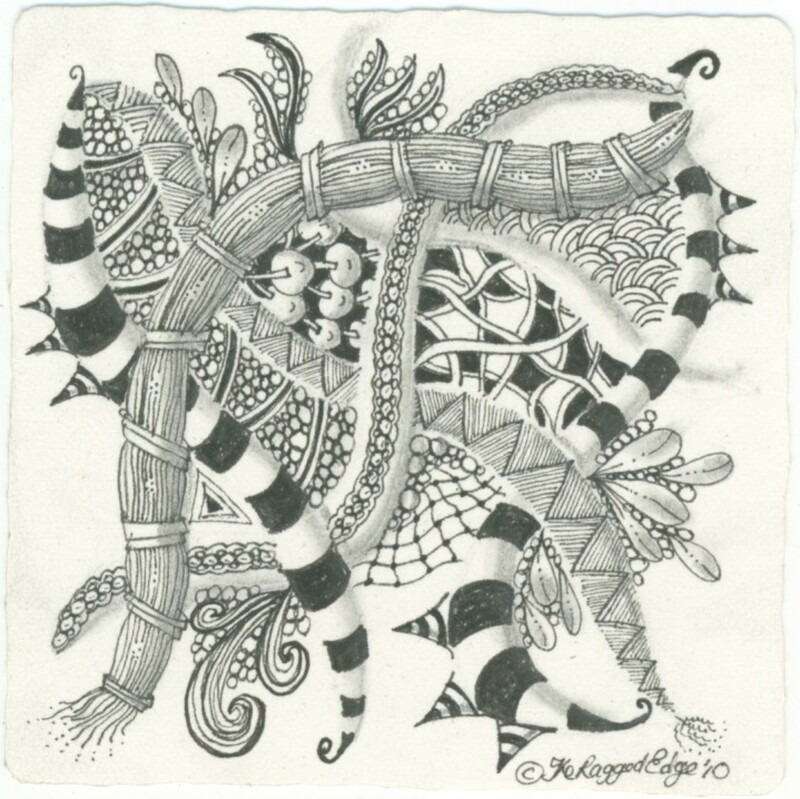 Various designs are drawn such as single or pair of peacocks, conch, fish, flower patterns, circular symmetrical patterns and so on. Finally, once again I enjoyed your article thoroughly. Sharing and pinning! Although Diwali is not a big holiday in the U.S., I can see many of your ideas applying to floor decorations for any kinds of celebration. Voting this Up and Useful. SHARED. 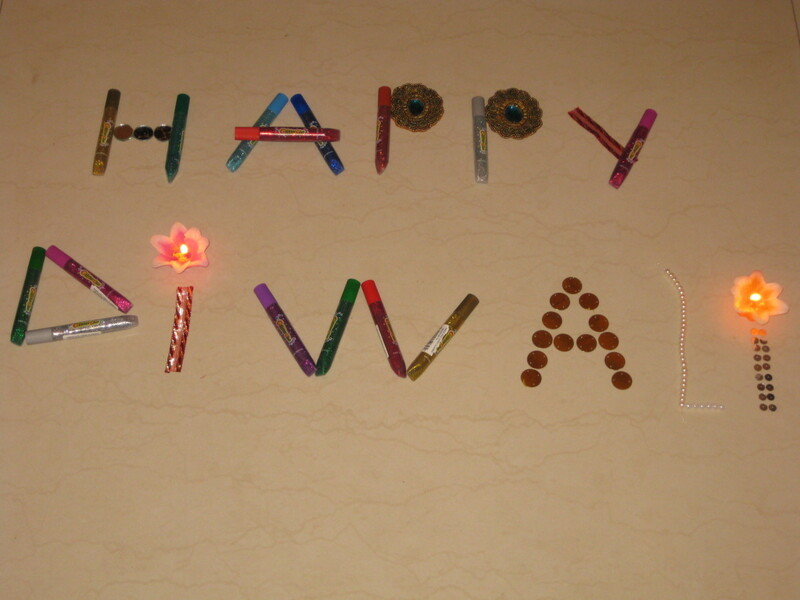 Happy Diwali. These decorations are awesome! What a great way to make the holiday more festive and joyful. All the photographs are gorgeous! Voted up. Thank you for a lesson about your wonderful culture! It sounds amazing and looks incredibly beautiful. Very interesting Hub. Nice to know about decorating for Diwali. @ thumbi7: Sorry. 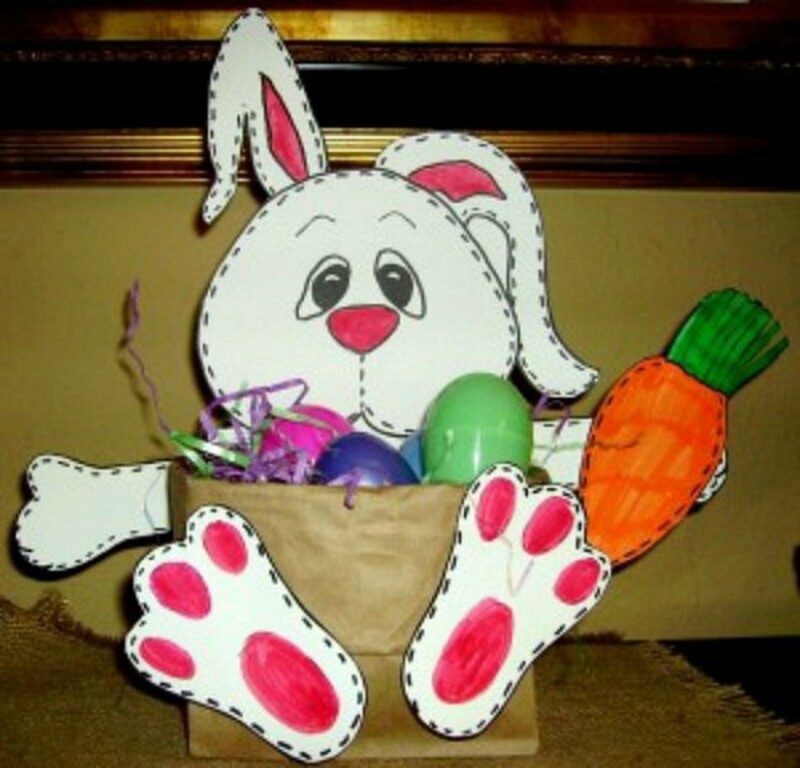 I forgot to add that please let me know after you tried this craft project with your kids.